I have always been a fan of Linux, trying my first distro (Red Hat) back in 2002 or 2003. That was before Red Hat went public and off of the standard desktop. Now they do that through their community-based distro called Fedora. Anyway, that's a different topic and a different review. With Linux becoming so popular, especially with distributions like SUSE, Ubuntu, Fedora, and others, I've turned my focus somewhat to some of the lesser-known distros. 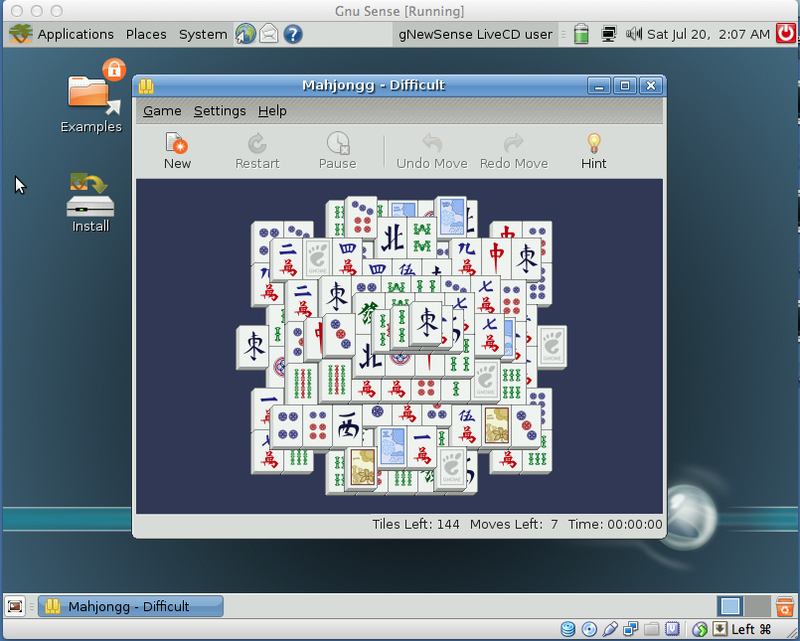 Recently, I discovered Netrunner and gNewSense. Today I will be focusing on gNewSense and save Netrunner for another time. As a disclaimer, please remember that I review primarily from the user experience viewpoint. I'm still a newbie in Linux programming and kernel operations. It is from this position that I immediately disagree with the concept for gNewSense. 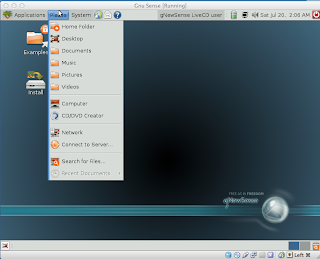 The mission of gNewSense is to gNewSense is "to remove all the non-free software from Ubuntu and Debian to make a 100% Free Software distribution. If you want to know why we consider 100% Freedom so important, see Why Free Software." The fundamental problem with the Free Software movement is that they want freedom for the software user, yet the fully free Operating Systems out there all restrict what users do. I was, for example, able to connect to the internet because Virtualbox allowed me to do so, acting as a sort of go-between for gNewSense and my Macbook. If I were to install it on its own, then it wouldn't work that way. It is, ironically, the free software movement that restricts, not the absence of free software. I tinkered around for a few minutes and realized I was looking at a previous generation of GNU. What do you think? GNU 2.0? I think that's what I'm remembering. The website for GNewSense doesn't say what they are using. 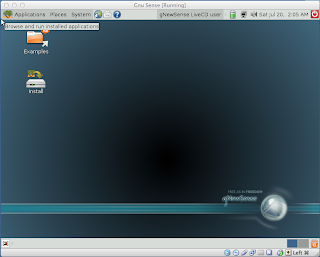 I've since learned, thanks to a different review, that it was based on Ubuntu Dapper Drake, which was released in 2006. 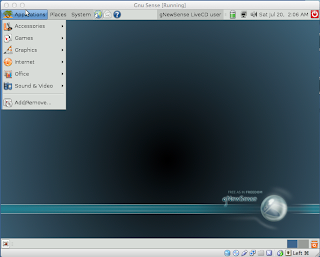 Anyway, as you can see from the below menu shots, they are not running the current version of GNOME (3.0). This is what Ubuntu was running several years ago before they switched to the Unity desktop. 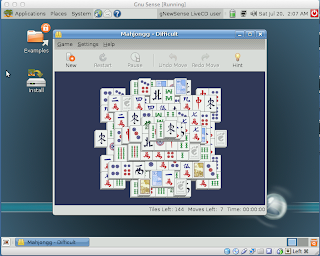 GNewSense comes with the standard Debian load-out as far as games are concerned. Once I get my internet settings up and running, I'll download Tuxkart or something and try it out. I expect it will work fine. Moving on to applications, I pulled up OpenOffice, which I like more than LibreOffice (not for any particular reason). This is how you can know that GNewSense is running older stuff. As you can see below, the GNewSense is running OO 2.4, whereas the updated OO is at 3.4.1. Ok, so screenshots and basics aside, what do I think about GNewSense? First of all, it's very basic. 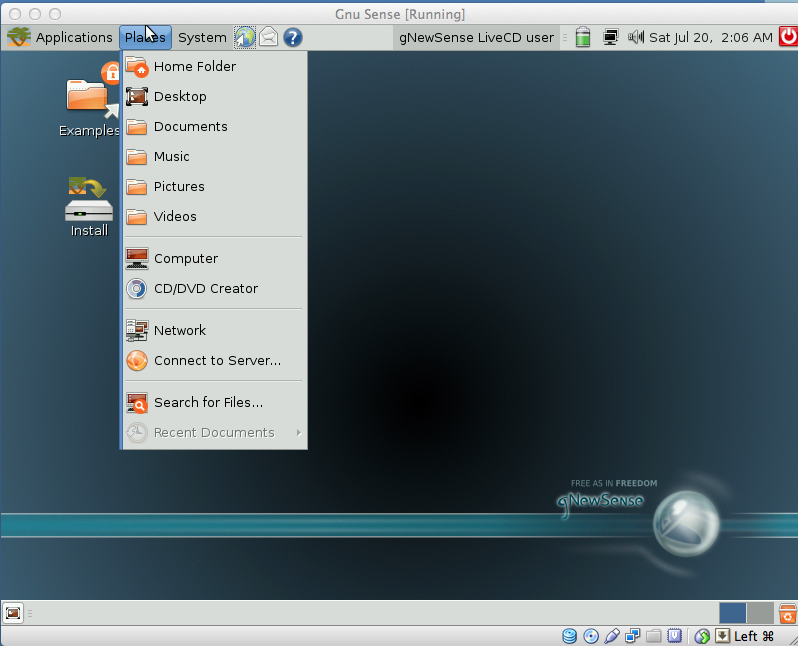 Think Ubuntu circa 2006 and you'll have the basic overview of GNewSense, as I mentioned earlier. Having said that, I was running a Virtualbox version of Ubuntu 12.4 and it was crawling. GNewSense flies! Unfortunately, like older versions of Ubuntu and other Debian-based distros, you have to set up your own internet if you're on a wireless system. Thankfully, because of Virtualbox, I didn't have to do that. It assumed a wired internet profile via Virtualbox, which connected to my Macbook and used my Mac's wireless system. Fortunately, if you're interested in gNewSense, you can look at their documentation to see their steps to setting a wireless internet system up. Using Ubuntu as the standard (which it is IMO), bloated or not, Ubuntu is already on the internet the minute you turn it on. Makes it easy, and as I am writing from the user experience, having to turn on my own internet is so...2000? Not cool. 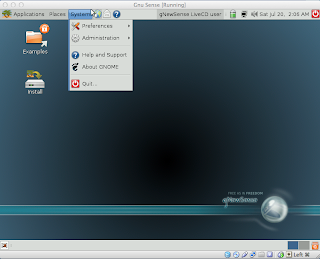 Overall, GNewSense is wonderful for tinkering around, particularly if you're on a slower or older system. If you spend a little time getting the internet set up, then it would be a fast, agile, and small OS. So in the end, I recommend it for older equipment and for tinkering, but not for your primary system. Again, it's the restrictions placed on it by demanding a completely free system. The real world doesn't work that way (yet) and it's too much to demand for an OS. I'll be tracking gNewSense though as I'm excited about future versions! gNewSense 3.0 is in development, according to the project website. What do you think of BSD? It too derives from AT&T's UNIX divestiture. We ran Free BSD (there are at least 4 competing versions) here until tech kid couldn't get it to print. Then it was back to Linux. 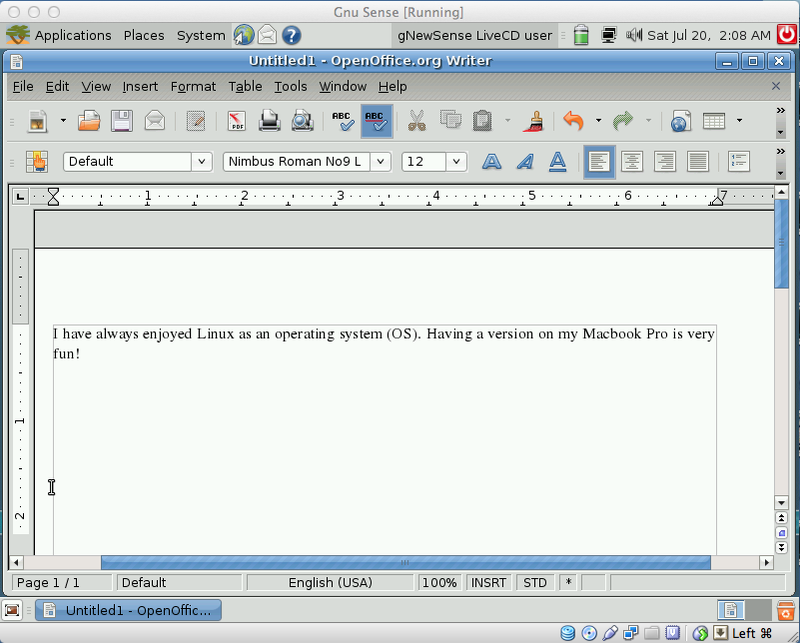 It is suggested by "some" that Linux will defeat both Windows and Mac OS because open source always beats proprietary. Interesting article here. I've dabbled with the idea of someday maybe trying out BSD. I've even gone as far as to download a BSD distribution. However, I tried to load two different versions and they are not as easy to do as Linux, so I will need to work on that more. I do agree with the idea that Linux will one day win out. I'm sad that it's Android instead of Ubuntu or Fedora/Red Hat, but it is what it is. Even Mac OS is based on Unix, so the fact is, the free stuff wins. Glad to hear you're a geek. I plan to post every other week or so about Linux.